You are not mistaken. Yes I am the one that moans about the bugerfication of the restaurant scene. And yes that is a word, or should be at least. I'm also the one that moans about being served food on anything other than a plate. 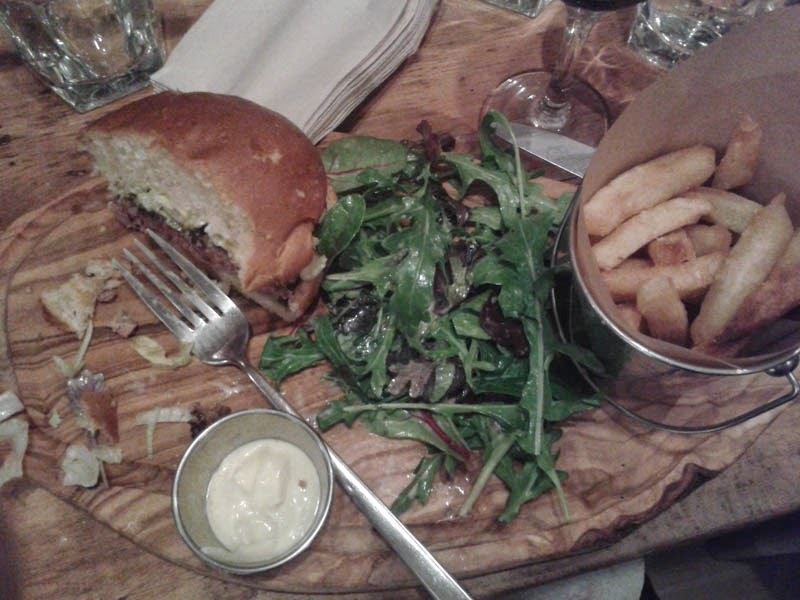 So what the very hell am I doing eating burgers off a wooden board here then? 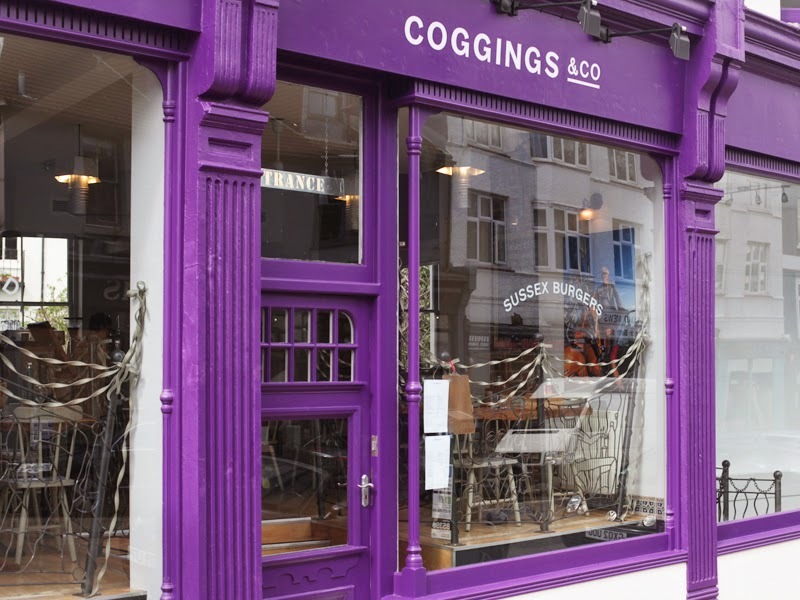 Well initially I did roll my eyes at the news on another burger/street/fast food restaurant in Brighton, but Coggings & Co seemed to be doing things a little differently, with a bit more style and professionalism. Their deep purple signage and branding is slick and the interior looked, well, like a real restaurant. The ingredients seemed very well sourced, heavily local and the drinks menu was excellent. I found myself uncharacteristically attracted. The food menu itself is streamline, which I also like, and confidently focused on the core offering of burgers, a few sides and desserts and little more. There were no gimmicks, no monster sized burgers, no chicken, ribs or whateverthehell and nothing had been given a tacky name. And the best bit? The lovely staff came over to my table to take the order! The sooner we nip this trend for ordering at the till in anything other than a motorway service station the better. 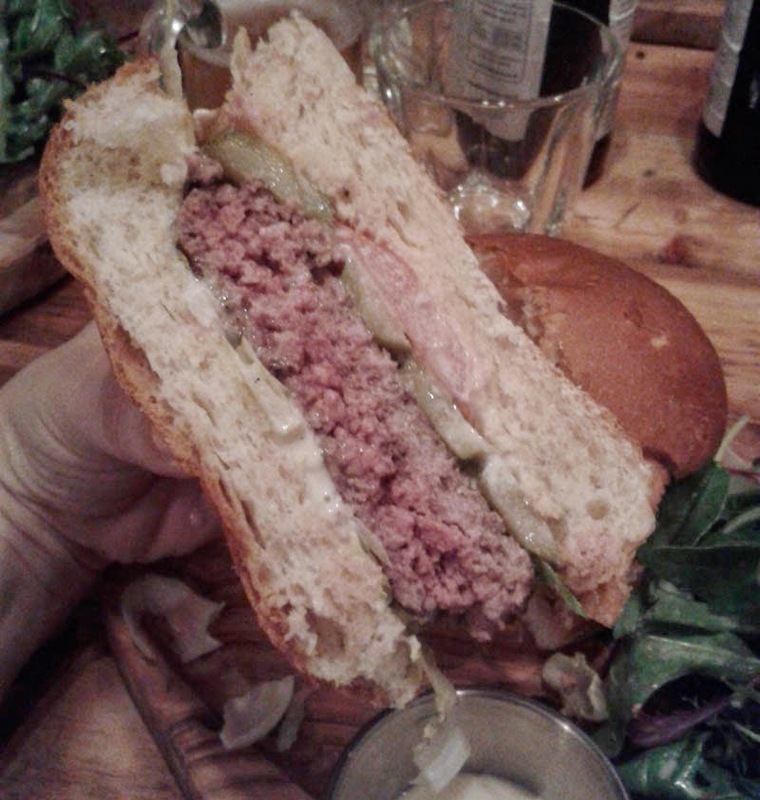 I opted for the simplest burger of them all; 6oz with tomato, mayo, lettuce and pickles. 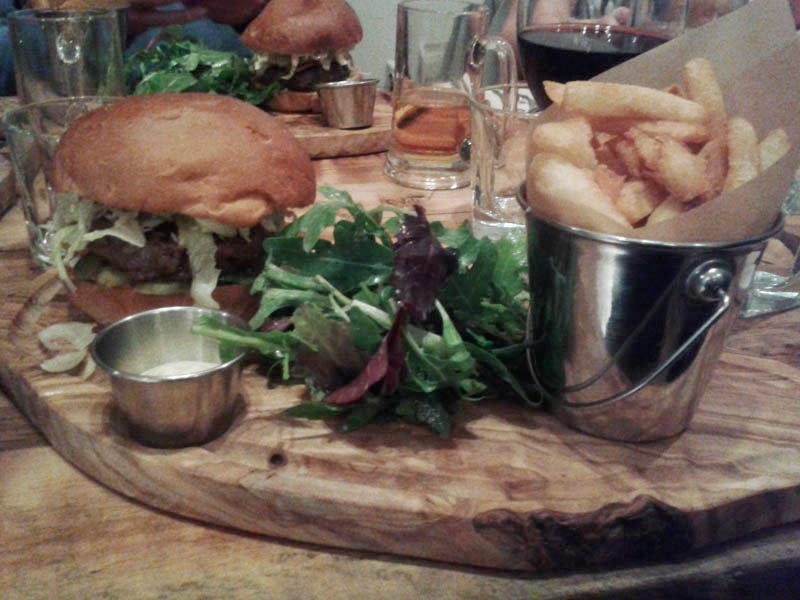 There was a choice of beef dripping or vegetable oil for the triple cooked chips. What? Is that a trick question? Is there a trap door under your chair that opens onto the hot flames of the grills if you choose the veg oil? There should be. Beef dripping, duh! And they were really excellent chips. Crisp and fluffy and worth every single calorie of the dripping. On my first visit, the burger bun was as dry as Ghandi's flip flop. They turn out to be by local bakery Real Patisserie which funnily enough I'm not a fan of their bread in general. It just didn't hold together which is a shame. The top fragmented and the patty slopped to the side as I was trying to eat. I had hoped I just got a bad batch which I think was the case as it was better on my second visit. I still didn't love the texture though as again it fell apart a bit but at least was not dry. Anyway, the meat turned up to the party and the patty was firm, juicy yet not gratuitously bloody, well seasoned and really flavoursome. Exactly as I like it. Maybe I'd scored by ordering the clean burger devoid of any trimmings to detract from the meat, but there was enough to enhance with just enough mayo and shredded salad to add crunch and clearly, the chef shares my love of pickles as there were plenty in there. I did try the chicken burger on my second visit which was a nice distraction from beef, but really I think the classic beef burgers are what C&Co are about. Desserts were surprisingly really very good. 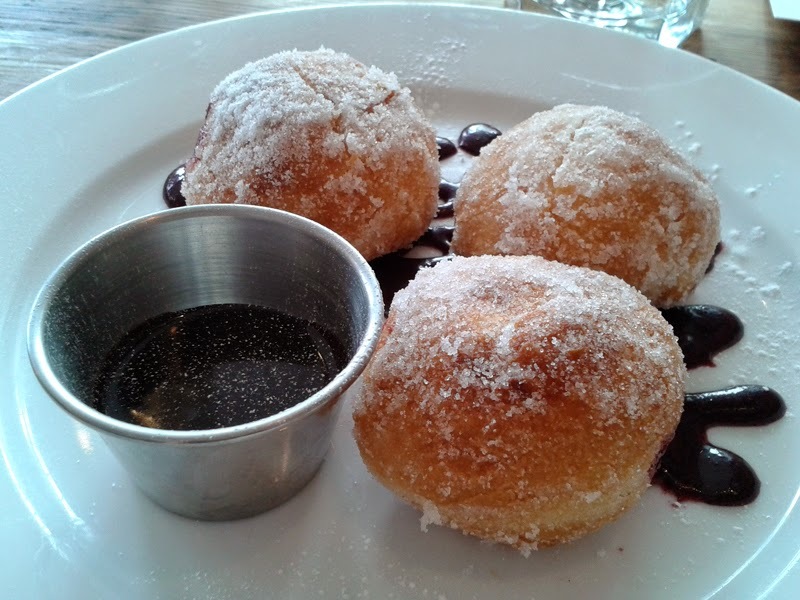 Everyone, particularly local blogger Rosie Swaffer, has been banging on about the donuts with black cherry curd and a chocolate dip from the fabulous Cocoa Loco and quite right they were too. My three perfectly light donuts were a treat and not too sweet with the tart cherry curd. 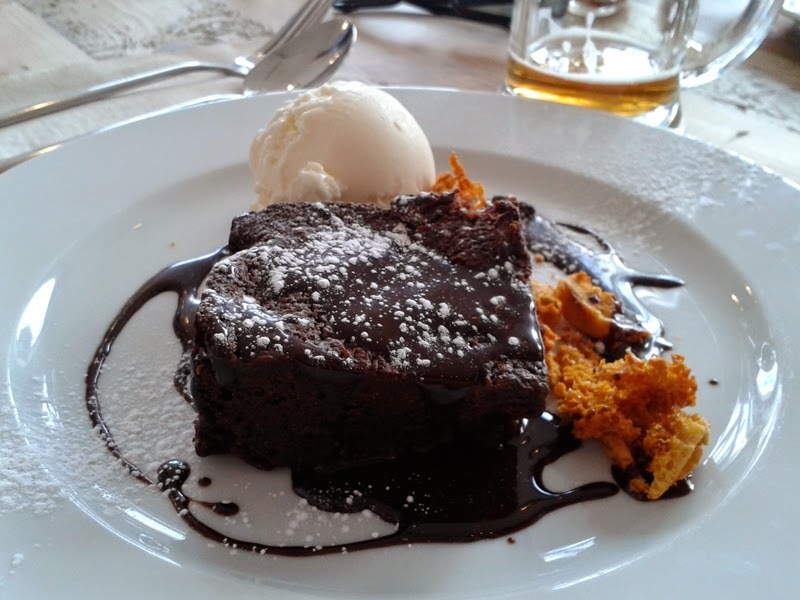 But best chocolate dessert had to go to the, again, Cocoa Loco chocolate, orange and almond brownie. Possibly the best brownie in Brighton I say. Orange, chocolate and almond is a hard to beat combination, especially with the added textural crunch of honeycomb. Spot on. The plus points with C&Co are, as I said before, the Sussex produce like the meat from Redlands Farm in Horam, Downsview ice cream, Blackdown Spirits, Plumpton and Bolney wines. There are plenty of homemade details, even down to the mayo - and I know burger joints that bang on about provenance, local local blah blah and break out the Hellmans. (You know who you are.) Prices are sensible, the staff are really sweet and even the loos are lovely. There is a gorgeous garden out the back that would be ideal for a sunny lunch or warm evening and a real rarity in Brighton. An effort has also been made with the kid's food. Baby Foodie would love their £6.50 menu and I would feel happy feeding it to him as a treat. So really my only little beef on my visits was the bun and I seem to be the only one to find that. 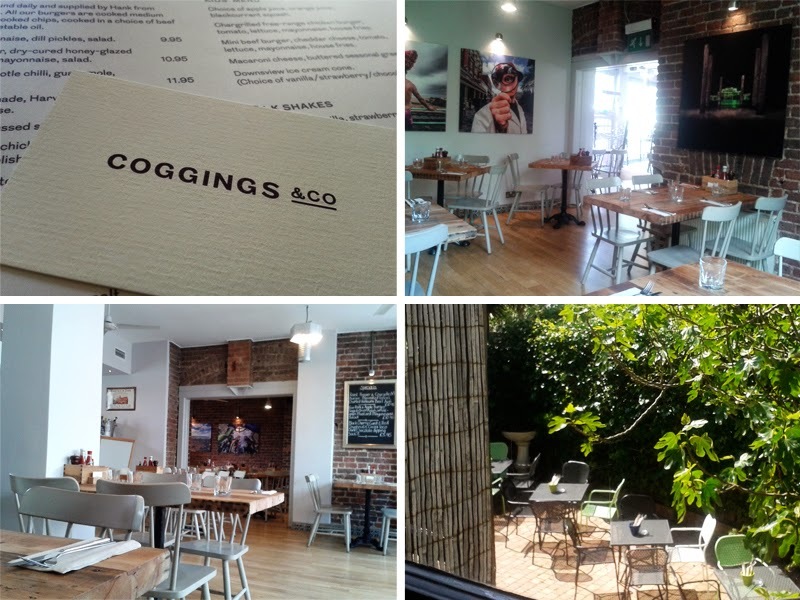 But hey, they seriously know what they are doing here and they should, the owner is Andrew Coggings, formerly of the successful Preston Park Tavern with a key passion for sustainability and local produce. He's created a proper restaurant. Not a pop up, not a pub, not a vehicle but a restaurant with sturdy tables, thick napkins, great drinks, menus that are not dog-eared and covered in filth and a floor that doesn't stick to my heels. This place works, and fills the gap in the saturated burger market with a quality burger joint for grown ups. I'm not going to start getting emotional about burgers or fill my Twiiter feed with "best burger in blah" claims but if you like to eat them, you can eat a darn good one here.